At one point in The Tashkent Files, a character declares that “vivek”, meaning conscience, and not “vote”, decides the fate of a country. Coming from director Vivek Agnihotri, this sounds like a victory statement. The Election Commission might have nudged one Vivek out of our way, at least for the time being, but we aren’t done with his namesake. In a polling season this critical, propaganda, like life, finds a way. Ragini is, of course, a stand-in for the director. Over the last few years, the Buddha in a Traffic Jam maker has been repeatedly accused of floating fake news on Twitter, and he now takes on a subject of great historical, and factual, controversy. To be fair, the facts aren’t easy. The shadow over Shastri’s mysterious death in Tashkent, Uzbekistan continues to persist. On January 10, 1966, the Prime Minister and senior Congress leader signed the Tashkent Declaration with Pakistan President Ayub Khan. Hours later, he died of an alleged heart attack in his room. A toppled thermos, dissimilar medical reports, and the Cold War… the material, as they say, is a real page-turner. This film, however, gets stuck at the foreword. In a bid to establish his objectivity, Vivek gives much play to all angles and ideologies. This is done in the style of those insufferable MUN school debates, with different actors representing different ways of thinking. There’s Pankaj Tripathi as Gangaram Jha, a communal scientist who applauds common sense but wears sports shoes to meetings. There’s Pallavi Joshi as historian Aisha Ali Shah, a wheelchair-bound dogmatist pleading history be left with the experts. There’s also Prakash Belawadi as retired RAW chief Ananthasuresh, who takes offence every time journalists cut up his name or miss the emphatic ‘h’. All these dignitaries — eight in all, Ragani included — are put in a committee to probe the Shastri cover-up. The bench is headed by Shyam Sunder Tripathi (Mithun Chakraborty), a senior opposition leader (the film is set in a UPA-like regime) looking to dig up some old bones, all while dealing with his own crooked hip. There’s some self-awareness on display. As she probes deeper into the case, Ragini is deemed an ‘anti-national’. Aisha, though straying completely off-topic, makes a point about mythology becoming history. These details, though poking fun at the previous government, stick out as ironic afterthoughts in the present scenario. This is not to give credit for any undue subversion to the film. 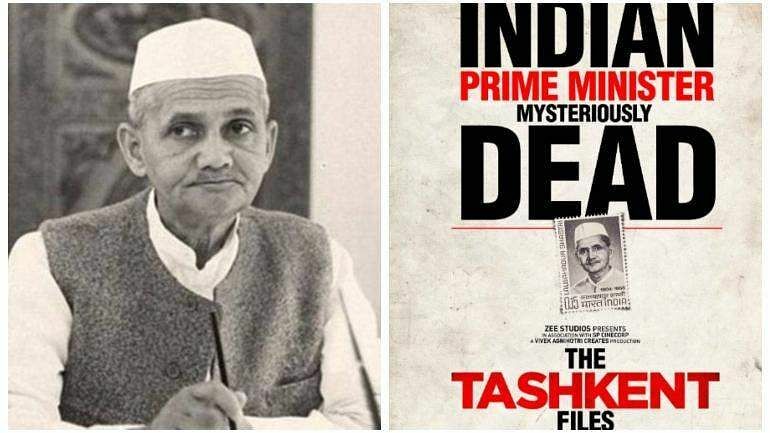 The politics of The Tashkent Files is unblinkingly unidirectional — so much so that, in one repulsively unethical scene, a real family member of Shastri is shown passing evidence to a fictional character. The Tashkent Files becomes increasingly weird as it goes along. A chaos of quotes, citations, claims and counterclaims grab you by the throat. The actors work up a fever pitch, shouting each other down while moaning the ‘death of democracy’. Naseeruddin Shah, reviving his evil cool from films immemorial, sniggers through it all. So confusing gets the puzzle that, at one point, Ragini, giving up, speaks directly to a statue of Shastri, begging for his help. Many ghosts are raised in Vivek Agnihotri’s new film, and many more are buried anew. One song, however, rings true. ‘Sach Jalta Hai.’ The truth is burning. But on both sides.